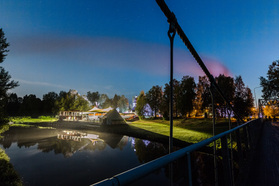 The Old Town in Rauma provides unique concert venues for this August celebration. Our programme of chamber music is a refreshing combination of familiar classics and lesser-known gems reflecting an annually changing theme. This chamber music event centres on the 300 year-old wooden cruciform church in the village of Iitti, about 70 miles northeast of Helsinki. The high point of the festivities will be hauling a piano to the lookout point at Hiidenvuori for a watchnight concert. The pianist Laura Mikkola has served as Artistic Director of the festival from its very foundation. Invigorating chamber music, philosophical debate and intellectual enquiry come together at this fascinating festival, with memorable performances in an idyllic garden city milieu just a short drive from Helsinki. Celebrating our 40th season in this, the sunniest of Finland’s seaside towns, with the finest musical events at Naantali’s splendid mediaeval abbey, in idyllic archipelago churches and at other scenic locations. The festival programme will include park concerts, an evening concert and the highly popular Naantali Children’s Music Festival, with the Winter Concert Series providing an early start on 9-10 March.